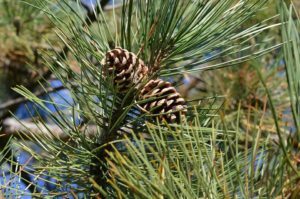 Hello and Happy Spring… As we thaw out in Maine, I’ve tried to keep my mind on planning events and sharing new crafts, but I can’t seem to shake my anxiety toward the instability in today’s world. I wake up with it and go to sleep with it. What happened? Well we know what happened… wars and changes in many governments and seemingly endless destructive world upheaval that feels completely overwhelming and out of our control. And the suffering is real… including millions of children worldwide, as well as those foreign-born who happened to want to make America their home in recent years. So many are being dealt an unfair hand. How do we teach our own kids to be world citizens, embrace and share our many cultures and religions, and just be kind and compassionate when they see the daily barrage of exclusion, deprivation and suffering of innocent families that is not only visible, but accepted? This is a sensitive issue for my family, having a child that IS foreign-born and was immigrated through a smooth and non-discriminatory process to live the American dream. We can’t give up on believing everyone can do better, take action, and somehow change the course of our future. Shouldn’t this country set the example for the world stage? You can also check out my Pinterest pages with lots of great pins of dragon craft activities, Duanwu traditions, and recipes for delicious glutinous rice dumplings (zongzi). 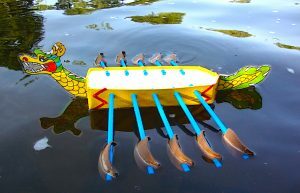 The team sport of dragon boat racing is a great example of unification and camaraderie of people from all parts of the globe and different ethnicities. 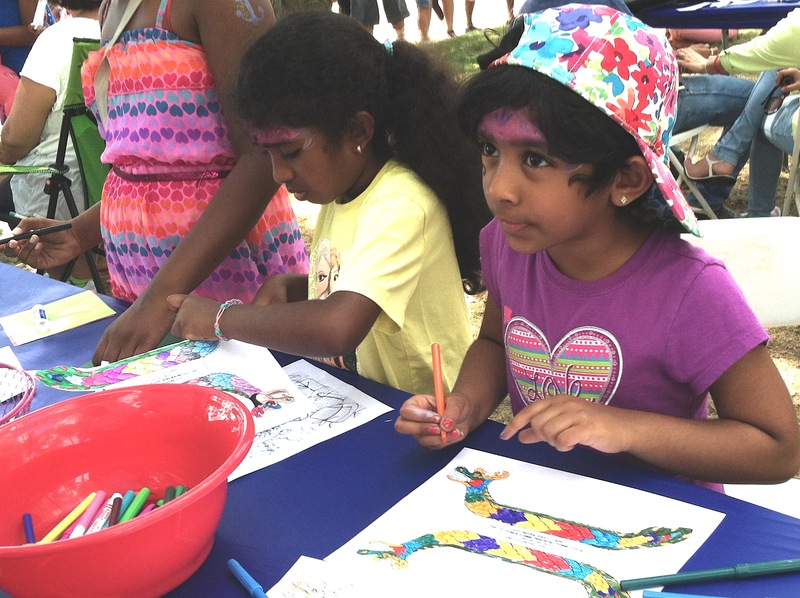 Even if simply enjoyed as a spectator, sharing this kind of cultural event with your family can help us all be shoulder-to-shoulder in appreciating and encouraging diversity in our communities. 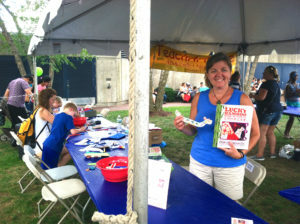 Lucky Bamboo Crafts have been part of the fun over these summer weeks. Life is a little slower, the weather is divine, and what better time to enjoy sharing crafts and Chinese culture with kids. 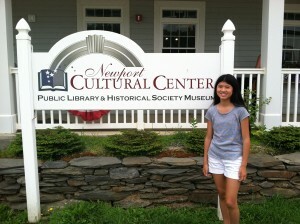 In July I headed to the Bangor Chinese School with my daughter to lead a workshop during their Chinese Dragon Camp. 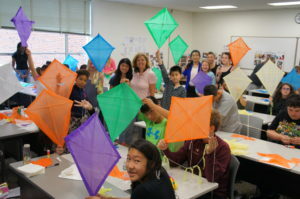 We made kites and chops in one short session which was pretty ambitious, but the kids ranged up to high schoolers and were great listeners and workers. They enjoyed coming away with authentic projects to bring home and share with their families. We loved walking the hallways beforehand and hearing intensive Mandarin classes going on in room after room. Dancers practiced in every corner. The camp was so alive with culture. 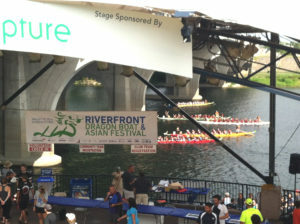 This month I was in Hartford, CT again for the Dragon Boat & Asian Festival along the river. This year was extra special as my good friend Alison came up from Greenwich, CT and joined me. 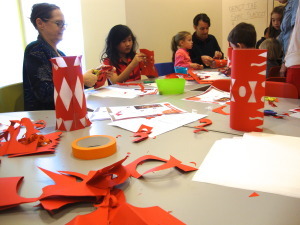 The kids made dragon boats, chopstick cases and other simple crafts. 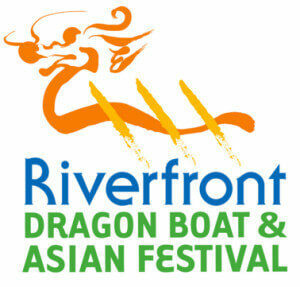 This is always a spectacular event of races, performances, activities and food. Now that I’ve shared craft projects with all ages, sizes of group and types of event, I am much calmer, more confident and let each event simply unfold. But just a small “pearl”… the constant in being successful has not changed since I first rolled out Lucky Bamboo Book of Crafts. Prepare, prepare, prepare. This would seem obvious, but I’m quite methodical about starting my supply list early, bringing ample quantities of the craft for a big crowd, and always throwing a little something extra in.. coloring sheets and crayons, origami paper, etc.. so there are choices for all ages. A craft session can really crash and burn if there is a whoops like glue sticks forgotten or insufficient pre-prep of a craft that makes the project too time-consuming and frustrating for the kids. The summer has been glorious on every front for me and the upcoming autumn days will be bittersweet, as my daughter enters high school. At 14 she is a wonderful partner and helper with craft events and in life, but it’s hard not to be aware of the fleeting time that has passed since I first started developing this book. She’s a young woman and I say that with pride and astonishment. As you start corralling school supplies and reviewing team schedules with your kids, I wish you a good transition and will be back soon with education-focused ideas. 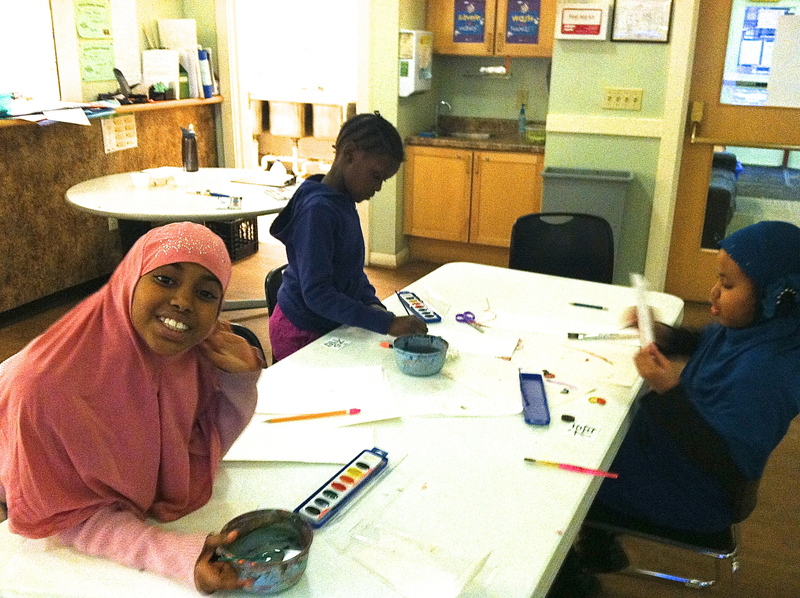 Day camps usually need quick make-and-takes while overnight camps often have a well-stocked art area where more involved projects can be done (many steps, or involving dry time in between). I’m excited to be leading a craft session this week at a local Chinese Dragon Camp through the Bangor Chinese School. It is a short timeframe since it’s a day camp with a rigorous Mandarin learning schedule, and we are making kites and chops which are both in Lucky Bamboo Book of Crafts. I have modified both projects to simplify the steps and cut the time considerably. The campers are grades 4-12 so I can have high expectations of their ability to follow the steps at a good clip. 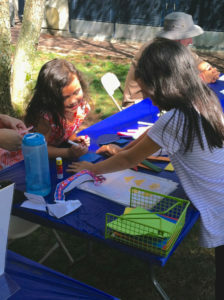 Some of my other favorite Asian culture camp crafts are fans, floating dragon boats, shadow puppets (and stage), paper making and knot tying, depending on the age level. If you don’t have multicultural or heritage camps in your area, consider how culture-specific projects can be worked in with your usual ‘greatest hits’ for camps crafts. One other mention this summer; two wonderful bloggers that are passionate about multicultural parenting have recently posted reviews of my book. Please check them out and share their lovely work at: www.hybridparenting.org and Oaxacaborn.com. The camp atmosphere is wonderful for teaching kids about being world citizens. 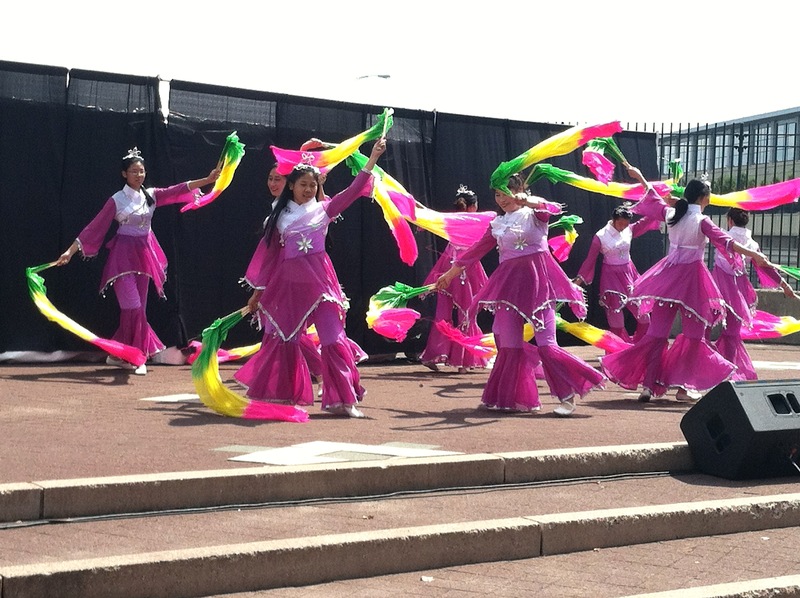 Music, cooking, dance and storytelling are just some of the other activities that can be rolled into an international theme. The best part is you have the great outdoors to be your art studio and you can gather materials from nature. Happy Camp Crafting! As we approach 2016, I’ve done a lot of contemplation on balance. I have a job I enjoy in project management, I’m raising a wonderful thirteen-year-old (yes, I even like her when she refuses to look up from her iPhone), and I have a cherished circle of friends that are anchors in my life. It all gets nicely rounded out by my Chinese craft and culture pursuits. Each area of my life makes the other areas richer… a yin and yang of sorts. So, on to the crafty stuff….. The Maine Chinese Conference was such a worthwhile event, spearheaded by a lovely dynamo of a lady named Jing Zhang. I gave both a keynote speech and demo (without fainting) and even was on the local news https://wabi.tv/2015/10/31/maine-chinese-conference-at-husson-university/. The conference area was packed with educators, language specialists and business leaders that had a common commitment to offering more language opportunities and cultural partnerships in Maine. An event like this really helps me see where I belong- with these likeminded people sharing ideas, educational tools… and food! It also motivated me to finally, finally(!) start to learn Mandarin. My baby-step approach; 365 days of study (which has been any form of media, flash cards, etc..) which was started on my birthday last month. Then I’ll see where I am, and consider a tutor in the future. Loving it! I’m thrilled to be invited back to Peabody Essex Museum in Salem, MA for their Year of the Monkey, Lunar New Year festival on 2/13/16. I’ll be doing what I enjoy most; leading the craft activities and sharing Chinese culture through projects from ‘Lucky Bamboo Book of Crafts’. I’m currently updating my website with a ‘Year of the Monkey’ free printable to get you started with your own projects. Check out my Pinterest pages too… lots of food, craft and culture pins to help you plan your projects and events. So here come the holidays, for what ever calendar you follow. Some have already passed. It’s the perfect time to get together with friends and family for crafts (which make great gifts), and to also make some goals to learn something new or explore a long-held passion more deeply. May you find a peaceful balance in your life in the new year! Greetings from Maine! Summer is still here, as far as I’m concerned. My daughter doesn’t go back to school until after Labor Day, of course falling late this year. So I see it as my obligation, living in “Vacationland”, to wedge in more fun with friends and family, and eat more lobster. I’ve woven a couple of great events into our Lucky Bamboo Crafts schedule this summer… an experience in contrasts. 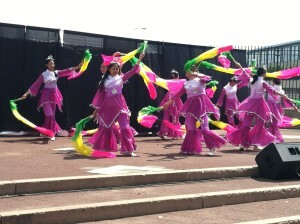 Each gave us a unique opportunity to share Chinese culture with very different audiences. 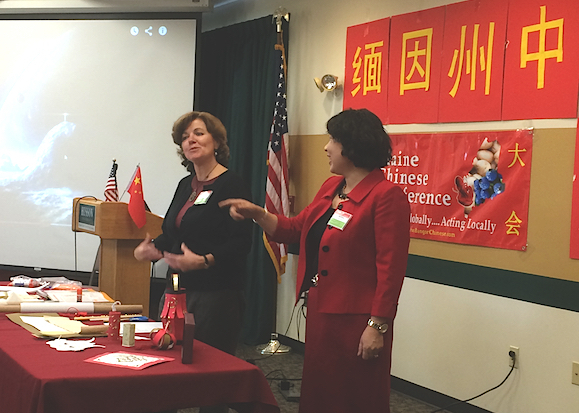 The Newport Cultural Center near Bangor, Maine hosted a Chinese craft and culture activity time at their multi-purpose center and library. 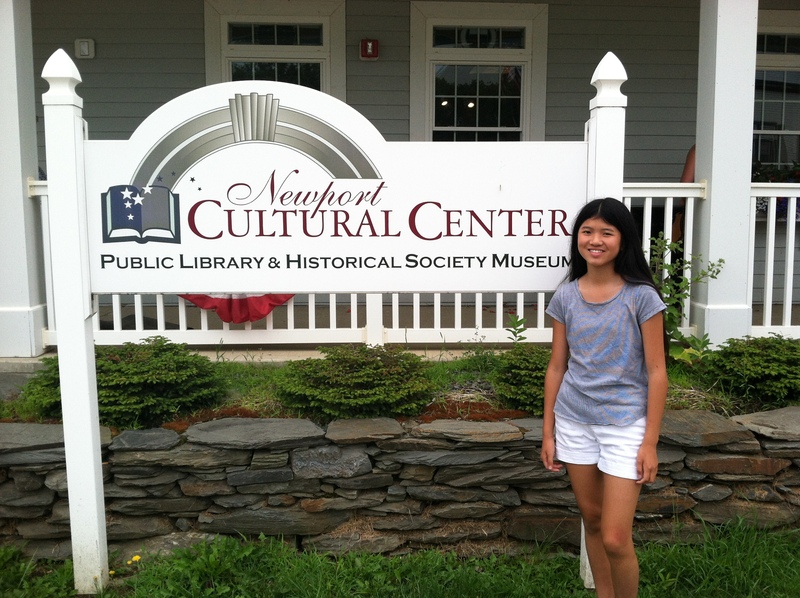 The summer program kids and other local library visitors in that area do not get much exposure to other cultures outside Maine rural life so it was very satisfying to share what I could about China. And with my daughter by my side leading the origami table, this proud mama also got to interject a bit about adoption and being a multicultural, multi-race family. 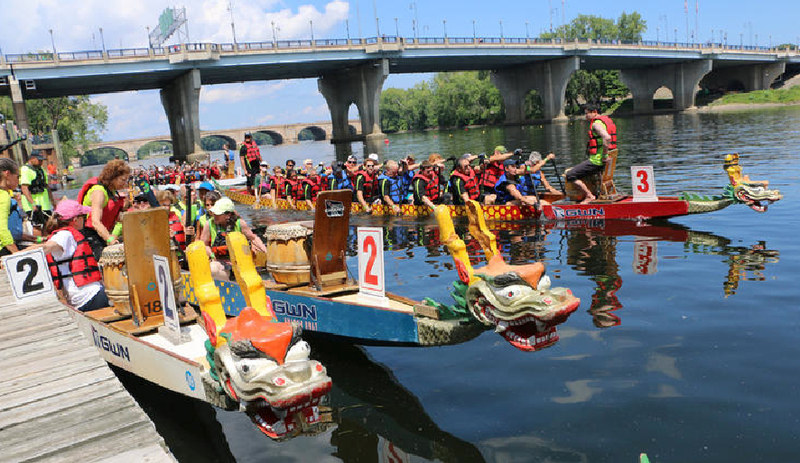 Then off to Hartford, CT for the Riverfront Dragon Boat and Asian Festival which I attended for the first time two years ago. I was yet again completely energized by the huge vibrant and diverse crowd. Along with leading the craft tables, I made sure to spend some time watching the dragon boat races, enjoying the performances and eating delicious Asian fare. Now that Lucky Bamboo Book of Crafts has been out for a couple of years, it’s particularly exciting when I’m able to still share my inspiration with loads of new people including educators and multi-ethnic families. My Crowdtivate campaign was extended for a few more weeks so please check out this link to my video and details! https://www.crowdtivate.com/projects/view/4261 I’m excited to be branching out to craft kits and appreciate the funding that has already been donated to bring this to life. The months ahead are still being planned for Chinese crafts. The Mid-Autumn Moon Festival, and the Year of the Monkey (as much as I don’t want to think about February in New England) will be my focus for planning some events and designing some new crafts. But for now, the lobster and warm breezes prevail! I’m jumping in here with a brief post to announce the launch of my (first ever) crowdfunding campaign for craft kits with the Crowdtivate platform. I was very lucky to have support from my Singapore friends with putting it together and getting it live. Marketing has never been a strong point for me but it was time to stretch a bit. Only 56 days left to get on board! Also I would love to hear from you with any feedback about this Lucky Bamboo Book of Crafts “kit” concept. Yes, I’m ready to make it grow! Here is the link to my campaign page: https://www.crowdtivate.com/projects/view/4261. Many thanks! Happy Spring! In Maine I should add a few more exclamation points this year… whew we have had a long wait. But I can now divert attention away from frigid weather and vitamin D deficiency and think crafts again. I am putting up a crowdfunding campaign soon for my newest little brainstorm- craft “kits” that will be a nice companion to the book. I’m starting small, selecting a few specific craft designs and offering some materials and partial assembly so crafters can dive right in. This is a new stretch for me… working out my goals and logistics. But my good friend and favorite business guru in Singapore is helping me get involved with Crowdtivate https://www.crowdtivate.com, a wonderful Asia-based campaign platform. The video intro seems to be my biggest stumbling block. Maybe if I hang around with my thirteen-year-old more I can pick up some camera and editing skills. I’ll keep you “posted”. 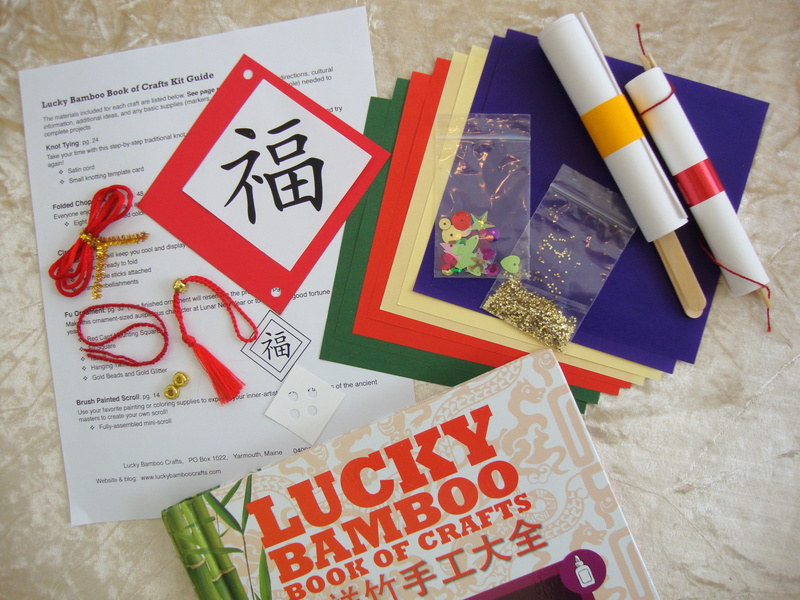 Now is a good time to think about summer camps, teacher gifts, grandparent activities, end of school gifts, and all the ways Lucky Bamboo Book of Crafts; Over 100 Projects & Ideas Celebrating Chinese Culture can be a part of the fun! 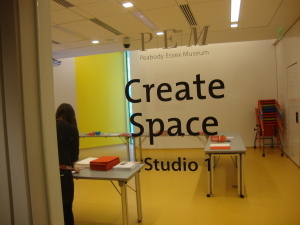 Soon after our return I led a craft at Peabody Essex Museum in Salem, MA. This was my “big event” for the season and they offered a terrific Lunar New Year program with many performances and cultural experiences. I also was thrilled that friends and family attended this one. With this event, I learned (again) that a single strong concept and very simple craft can be fun and engaging for all ages. 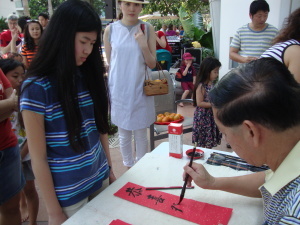 My daughter was proud that her “Lucky Lantern” was selected to offer to the visitors, out of all the designs in my book. We adapted it slightly (fewer cuts and a tracing paper liner) and gave away a tea light with the lantern. I hope no matter which calendar you follow, you have gotten as positive a fresh start to the year as I have, and find many ways to enjoy being creative with your family, friends and students. 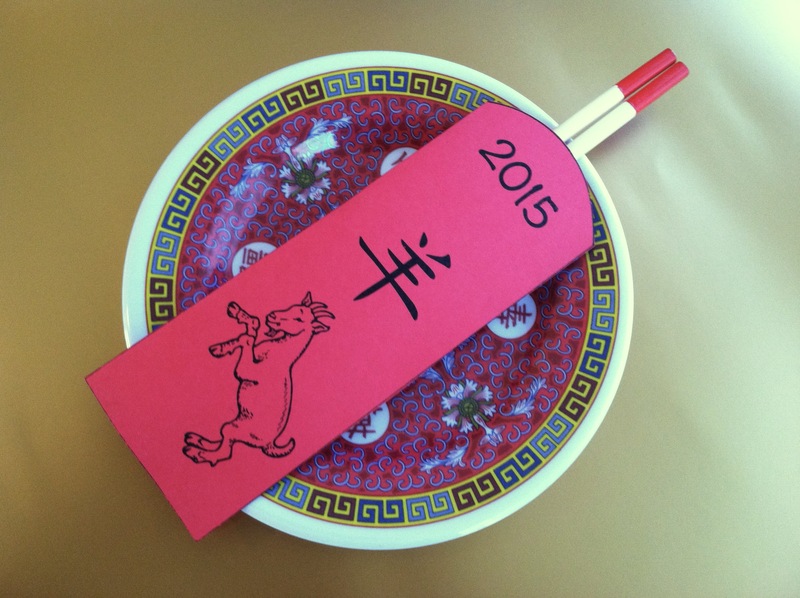 Now that we are back in gear after school break, I have some lesson plan suggestions for Chinese New Year in the classroom as you begin your planning. These ideas are all personally “teacher tested” and they can adapt up or down for grade level. The actual date of ‘Year of the Goat’ (also known as Ram or Sheep) is February 19th, 2015. I point this out because for most districts, this will fall during February break so you will want to celebrate the week of the 9th, or hold off until the end with the Lantern Festival falling on March 5th. 1) History- Start with a brief historical overview about the meaning and significance of the holiday. This is when some students will interject they know “all about it”… but for Western classrooms most don’t think about Chinese culture or the holiday at all for the rest of the year. They can use a refresher! 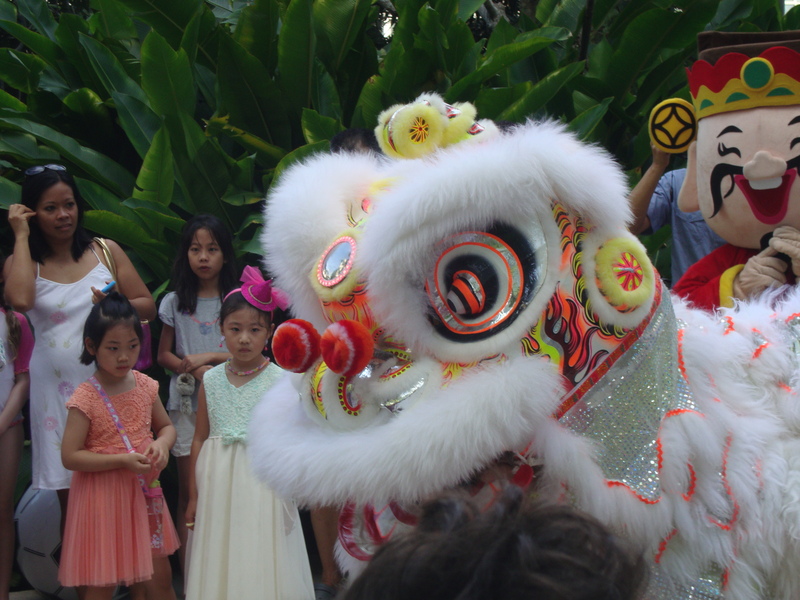 Include common ancient folklore such as the story of Nian the monster (great for younger kids) as well as the meaning behind the lunar zodiac, dances, parades and respectful time and rituals with family. 2) Food- Any teacher knows if you offer something edible, you get a captive crowd (actually that is true for many situations?). This could be as elaborate as dumpling making, or as simple as giving out almond cookies… but either way, discussing the traditional foods of a Chinese New Year banquet and their symbolism should be part of the plan. 3) Decorations- Adorning the classroom with paper garlands and lanterns, ‘Fu’ art, couplets on the doorways, and bowls of citrus, etc… is an essential part of the festive celebration. Lots of red! 4) Craft time- Select appropriate projects to grade level and time set aside. 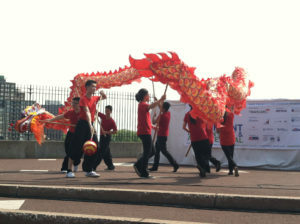 If you want a group activity, making a giant dragon dance head is a good activity to preface a parade around the school. 5) Giveaway- Hong Bao (lucky money red envelopes) are inexpensive in solid packs and a nice gift (in the spirit of the holiday) for your students. You can enclose a shiny penny, a fake gold Chinese coin, or a small toy or candy. If you have trouble finding them locally, there are numerous mail-order sites. Of course the students will already have a snack and a craft and that may be enough! 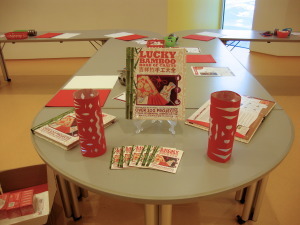 For specific ideas, instructions and templates, I encourage you to add Lucky Bamboo Book of Crafts to your resource library! You can also check out my Pinterest pages, and my free printable craft off this website. As an educator, you are also probably web-savvy and can do research for your particular class. I think the most important piece is framing how this holiday fits into a multicultural world, and how extremely significant it is to Chinese people, where ever they call home. You will find that sharing the Lunar New Year with your students will tick many curriculum boxes and most of all, will be loads of fun! 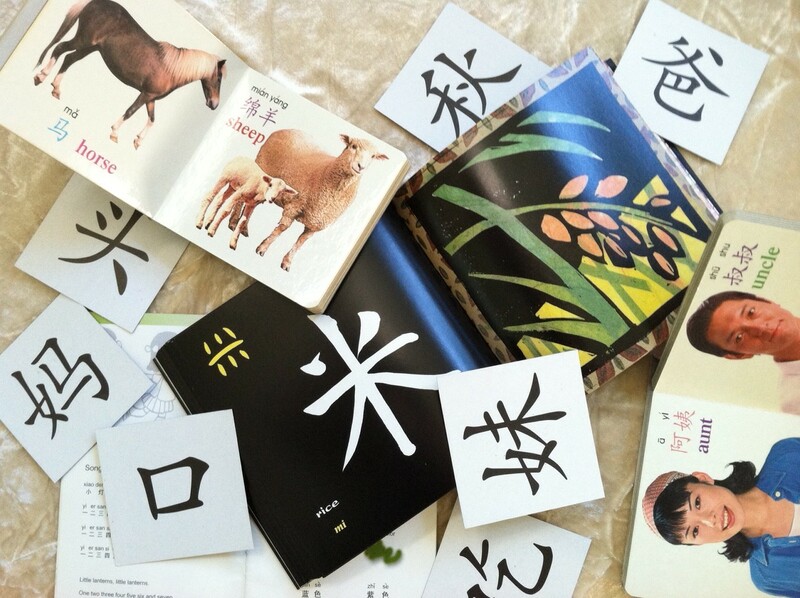 Now that my daughter is settled back into school and learning is a focus around here, I’m thinking about one of my own goals- I want to learn Mandarin. This is not new, just deferred over and over again with many fits and starts. Life has gotten in the way for me, with several months of unexpected “down time” as far as starting new pursuits in earnest and having the time and energy for them. But I’m hoping to move beyond the day-to-day of my job, mum commitments, and essential tasks and try to stretch again. Why? Admittedly, I have a very “what’s the point?” nature and am proprietary with my time. I know Mandarin will not be essential for any of my upcoming plans. But who knows what new plans may emerge as a result of getting my feet wet? I certainly will travel back to China eventually… and with some language under my belt perhaps I can be a cultural participant vs. a confused tourist. As with Lucky Bamboo Book of Crafts, knowing some Mandarin will reinforce to my daughter the importance of our multicultural world view, attitude and life. 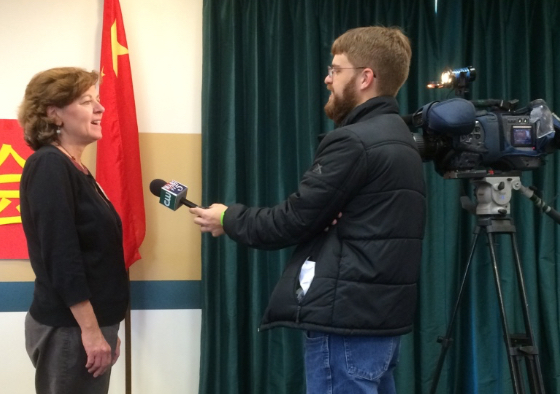 I would also love to reach out to my local Chinese community more, and in their native tongue. There are lots of events and “practice Mandarin” roundtables and also our local Confucius Institute that can bolster this effort. 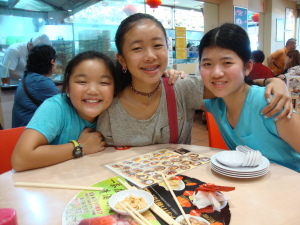 Our high schools and colleges host many Chinese exchange students and teachers that would always embrace another Chinese speaker. What will be the plan… online tools and videos? 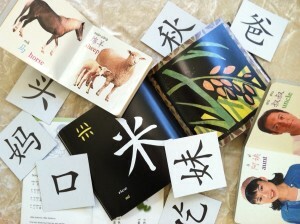 (Including Fluentlee.com, a great online real time language instruction site). Classes or immersion with a private local teacher? Pinterest is a good source to get started and I’ve already rounded up some helpful pins on my ‘Learn Mandarin’ board. I’ve put a couple of apps on my iPad too…. now the commitment! Yes I hear the collective sigh… don’t we all have those many goals as we turn the page, or the season, or the life change, or the birthday or the year? But that’s what makes us feel alive, and reminds us that the future can be full of wonder and growth (at any age!). 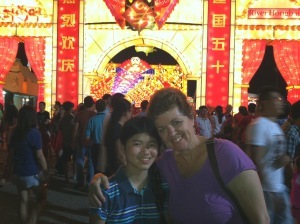 And how about my Chinese twelve-year-old? Well the reality is she has embraced learning French with such ease and determination, I don’t want to break her stride and insist on a “come with” on this language journey. Maybe she will catch the fever later on. She definitely embraces the idea of being a world citizen, but that seems to be spread across several continents, not exclusively Asia. Ok I’ve stated my plan. It’s documented in the e-world and for now, I have run out of excuses. 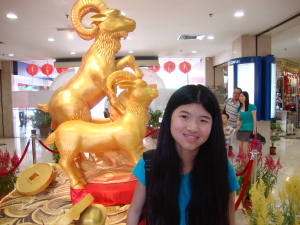 Have you or your kids taken on Mandarin and why? How have you learned and what has made it fun and kept you motivated? I’d love to hear from you!